Trevor Bayne exchanged vows with new wife, Ashton, on Tuesday and celebrated their honeymoon on Sunday by winning the NASCAR Nationwide Series DuPont Pioneer 250 at Iowa Speedway. Bayne passed Austin Dillon with 11 laps remaining of Austin Dillon – who had led 207 laps – clinched the victory. The Roush Fenway team was all smiles, including Ashton, who attended the post-race press conference. The victory was the fourth in the last five Nationwide races at Iowa Speedway for crew chief Mike Kelley, who guided Ricky Stenhouse to three straight wins here in 2011 and 2012. Bayne closed the gap and pulled alongside Dillon with about 15 laps remaining when Dillon seemed slower due to lap traffic. The pair made contact and Dillon became loose, allowing Bayne to pass and pull away for the victory. The long runs seemed to benefit Bayne more than Dillon. It played a factor that the race remained green for the last 72 laps after the fifth and final caution. The goal was to keep Dillon in sight for the late surge and it became a strong possibility about five laps before the final lead change, according to Bayne. It also marked the 200th win for a Ford car on the Nationwide Series, which began in 1982 and ranks second to Chevrolet (376). Kelley said the team had to make huge progress on the car’s setup to contend for a win and provide that wedding present they wanted for the happy couple. They had to make numerous adjustments during a day of inconsistent conditions that varied between sunny and cloudy and dry and rainy. They had to constantly adapt, preferring the cloud cover. The race originally was scheduled for Saturday night but postponed due to rain. The team has faced adversity on and off the track all season long. They have persevered through tests, so the conditions, including the long delay, were easy to handle. Dillon dominated nearly the entire race, leading 156 of the first 187 laps. Instead, the power wasn’t there at the end to close out the dominating performance. He said the No. 3 car didn’t have enough drive into the corner and Bayne was better at the end. He didn’t seem to have an issue with the late contact with Bayne, who made contact with Regan Smith during a restart before the rain delay that helped Dillon jump from fourth to first before the red flag. Dillon posted his best finish of the season, earning his third straight pole. He now has six top-five finishes and seven in the top 10. Elliott Sadler recorded another top-five finish at Iowa Speedway. He placed third, but was too far away to challenge the top two. Sadler rebounded from a disappointed finish at Dover International Speedway last week. Things appear to be moving in the right direction. Sam Hornish Jr., who battled Dillon for early, finished fourth after leading 22 laps. He now trails season points leader Regan Smith by 23 points. Smith finished seventh. Kyle Larson, the highest finishing rookie, rounded out the top-five. 1. 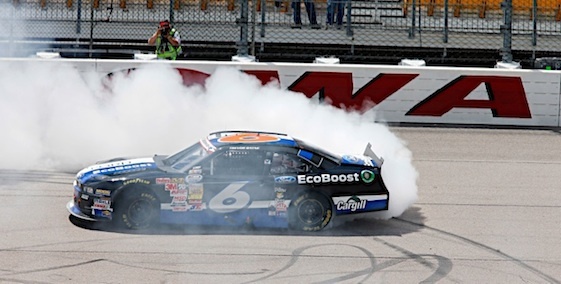 (14) Trevor Bayne, Ford, 250, $86690. 2. (1) Austin Dillon, Chevrolet, 250, $68500. 3. (7) Elliott Sadler, Toyota, 250, $49400. 4. (2) Sam Hornish Jr., Ford, 250, $35350. 5. (10) Kyle Larson #, Chevrolet, 250, $33175. 6. (3) Brian Scott, Chevrolet, 250, $28975. 7. (5) Regan Smith, Chevrolet, 250, $27835. 8. (11) Justin Allgaier, Chevrolet, 250, $26795. 9. (6) Ryan Blaney(i), Ford, 250, $25675. 10. (17) Mike Bliss, Toyota, 250, $25975. 11. (9) Drew Herring, Toyota, 250, $24200. 12. (21) Johanna Long, Chevrolet, 250, $17650. 13. (13) Kenny Wallace, Toyota, 250, $17125. 14. (12) Parker Kligerman, Toyota, 250, $22600. 15. (27) Reed Sorenson, Chevrolet, 249, $22425. 16. (19) Cole Whitt, Toyota, 249, $22550. 17. (24) Jeremy Clements, Chevrolet, 248, $21900. 18. (30) Eric McClure, Toyota, 248, $21450. 19. (28) Kevin LePage, Toyota, 248, $21225. 20. (36) Mike Wallace, Chevrolet, 247, $21675. 21. (26) Dexter Stacey #, Ford, 246, $14875. 22. (15) Alex Bowman #, Toyota, 244, $20750. 23. (31) Harrison Rhodes, Ford, 243, $20600. 24. (39) Daryl Harr, Chevrolet, 243, $20475. 25. (22) Nelson Piquet Jr. #, Chevrolet, 243, $20825. 26. (37) Ken Butler III, Toyota, 242, $20225. 27. (32) Joey Gase, Ford, 240, $20100. 28. (20) Kevin Swindell #, Ford, 198, $13950. 29. (4) Brian Vickers, Toyota, 196, $19825. 30. (18) Michael Annett, Ford, Accident, 177, $20000. 31. (25) Max Papis, Chevrolet, Accident, 155, $19550. 32. (8) Travis Pastrana, Ford, Accident, 154, $19455. 33. (40) Tim Schendel, Chevrolet, Transmission, 64, $13335. 34. (16) Brad Sweet, Chevrolet, Engine, 35, $19215. 35. (38) Juan Carlos Blum #, Chevrolet, Engine, 15, $19097. 36. (23) Blake Koch, Toyota, Brakes, 10, $12125. 37. (35) TJ Bell(i), Chevrolet, Electrical, 7, $12015. 38. (33) Carl Long, Ford, Axle, 5, $11936. 39. (29) Jason Bowles, Chevrolet, Vibration, 5, $11745. 40. (34) Jeff Green, Toyota, Vibration, 2, $11630. Average Speed of Race Winner: 102.472 mph. Time of Race: 2 Hrs, 08 Mins, 05 Secs. Margin of Victory: 2.023 Seconds. Caution Flags: 5 for 31 laps. Lap Leaders: A. Dillon 0; S. Hornish Jr. 1; A. Dillon 2-8; S. Hornish Jr. 9-24; A. Dillon 25-53; S. Hornish Jr. 54-58; A. Dillon 59-135; T. Bayne 136-138; M. Annett 139-140; A. Dillon 141-151; T. Bayne 152-155; A. Dillon 156-238; T. Bayne 239-250. Leaders Summary (Driver, Times Lead, Laps Led): A. Dillon 5 times for 207 laps; S. Hornish Jr. 3 times for 22 laps; T. Bayne 3 times for 19 laps; M. Annett 1 time for 2 laps. Top 10 in Points: R. Smith – 448; S. Hornish Jr. – 425; J. Allgaier – 404; A. Dillon – 402; E. Sadler – 388; P. Kligerman – 385; B. Vickers – 384; B. Scott – 381; T. Bayne – 368; K. Larson # – 361.